Usually, it’s a close race to the top, but this year a new series produced test results that far exceeded the other water ionizers. We are pleased to announce the winner of AlkalineWater.com’s 2019 Ionizer of the Year Award… the 11 Series from Tyent USA! The MMP 11 and the UCE 11 are very simple to use. They both have easy touchscreen operation. The UCE 11 screen is modeled after a smartphone. Both machines feature voice commands. We found that the 11 Series machines were very easy to program and to adjust based on different types of source water. 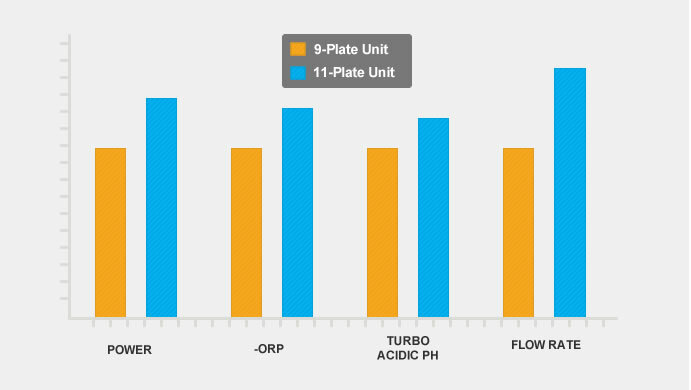 The 11 Series water ionizer machines offer a significant power increase over the 9-plate models that we tested. The extra two plates result in a power boost of up to 750 watts. This boost only happened when we activated the TURBO function on the ionizer. The 10 amp SMPS Plus power supply also offers close to 20% more amperage than the 9-plate machines. This increase in plates and power resulted in roughly a 25% increase in pH and -ORP in our tests. Tyent USA offers a lifetime parts and labor warranty with no stipulations. We read through all the fine print of warranties from other water ionizer companies, and none compared. This is the best warranty that we’ve seen available in the water ionizer industry. Overall, we are thoroughly impressed with the power and performance of the countertop MMP 11 and under-the-counter UCE 11 water ionizer machines from Tyent USA. We enjoyed testing all the newest models of water ionizer machines from the biggest brands out there. I want to buy the best one period. STOPED FOR FIVE DAYS, I HAVE DRANK ABOUT FOUR GALLONS. I NEED A BETTER WAY TO OBTAIN THIS PRODUCT. How much is the machine 2014? I would love to get one for my home..May someone contact me in reff to getting a home unit? healthy water, verses purest water, verses cleanest water what is the difference ? micron filters do there presence in ionizers remove fluoride?